Cellular polarization is key to all cellular functions. Our perceptions, which are derived from our senses, depend on the proper cellular polarization of our sense organs, such as the eyes or ears. 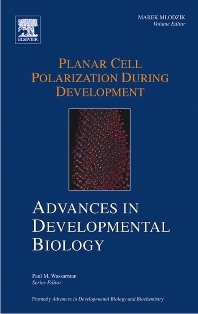 Much of this book examines the different aspects in cellular polarization and its researched role in the Drosophila, where the first planar cellular polarity (PCP) gene was discovered over 20 years ago. Topics also include: From flies to man: how we are polarized, Marking an embryo work, Cellular polarization at its functional best, Hearing and seeing your environment, and From a cell to an organ. This series represents timely issues in developmental biology. It provides annual reviews of selected topics, written from the perspectives of leading investigators in the field of development.